Brookfield will be the site of a Democratic gubernatorial candidate forum next month that will focus on key issues facing the state. 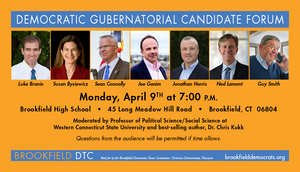 The April 9th event was announced this morning by the Brookfield Democratic Town Committee (BDTC). The forum will be moderated by Professor of Political Science/Social Science at Western Connecticut State University and best-selling author, Dr. Chris Kukk. Candidates will have the opportunity to introduce themselves, followed by a period of questions and answers, led by Dr. Kukk. Questions from the audience will be permitted if time allows. The forum is free and open to the public. Seating will begin at 6:30 p.m. The event will be open to the media. Reserved seating will be available.